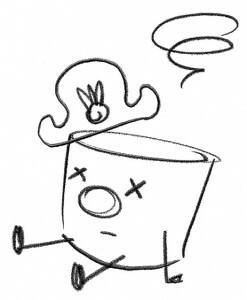 Stolte was referring to Home Bar Basics (and Not-So-Basics), the 112-page, pocket-sized book that he authored and subsequently funded via Kickstarter. The book is a guide to setting up a home cocktail bar with an emphasis on history, quality, and craft. Tips and techniques include selecting spirits, making the best ice at home, and how to choose fresh citrus. 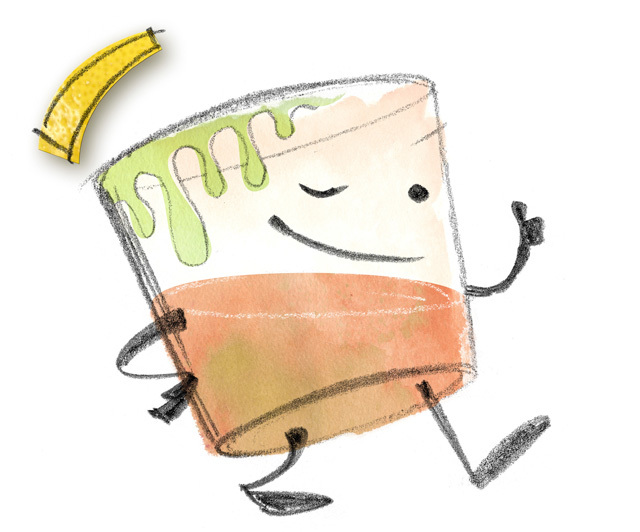 Home Bar Basics (and Not-So-Basics) features Stolte’s whimsical original illustrations, checklists, and easy-to-read instructions. 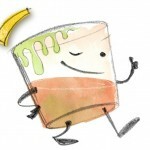 Twenty-five cocktail recipes range from standards like the Sazerac (pictured at top) to tiki classics (Zombie, Navy Grog, Mai Tai) and modern craft cocktails like the Penicillin. Quality design touches include the spiral binding for easy lay-flat reading and full-color, professional printing on water-resistant, tear-resistant synthetic paper for durability. The book has received endorsements from Eric Alperin of The Varnish, Paul Harrington (Cocktail: the Drinks Bible for the 21st Century) and Mike Rowe (Dirty Jobs with Mike Rowe). 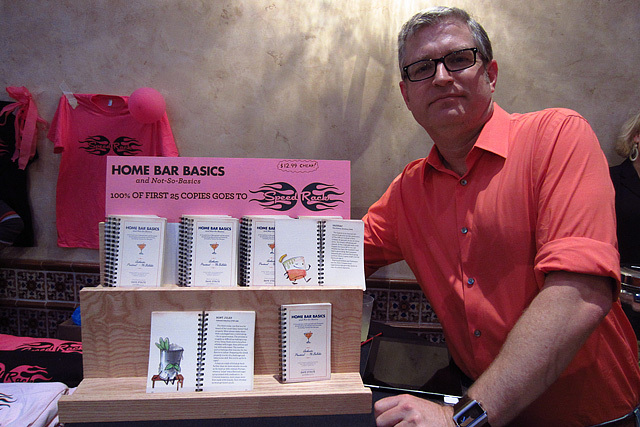 Home Bar Basics (and Not-So-Basics) is published by Wexler of California and is available for $12.99 at homebarbasics.com, the companion website that builds on the content of the book with additional recipes, product and bar reviews, and instructional videos. You can also follow the project at Facebook and Twitter. Despite the driving distance from his Southern California home, Stolte is a frequent visitor to LA bars and events. I’ve had the pleasure of bending an elbow with Stolte and his wife Kristin on numerous occasions, and it’s been particularly gratifying to watch the book evolve from rough drafts and mock ups to publication. At Speed Rack LA, author Dave Stolte donated sales from his book to Speed Rack. 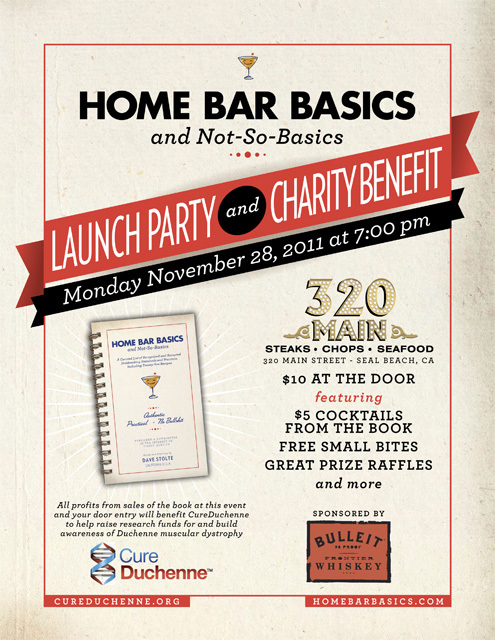 On Monday, November 28th, Stolte is hosting a launch event for Home Bar Basics (and Not-So-Basics) at 320 Main in Seal Beach. Entry is $10 at the door. The book launch will feature $5 cocktails from the book, along with free small bites from 320 Main’s acclaimed menu. Raffle prizes include a basic bar kit from Hi-Time Wine Cellars, wine from the boutique Miramonte Winery, a one-on-one homebrew session with Topanga Brewing Company, Moscow Mule mugs filled with 320 Main drink tokens, framed cocktail art by Stolte, and more. All profits from sales of the book at the launch event and your $10 door entry will benefit CureDuchenne, to help raise research funds for and build awareness of Duchenne muscular dystrophy. More info about the book launch at the Facebook Event page.